Cheddar is one of the most popular cheeses. The mere mention of the name can bring many cheese lovers to salivate. So cheddar is cheddar, right? Definitely not! Cheddar is made in just about every English-speaking country and just as different countries have different accents, so they make different cheddar. The Amish treat their cows as part of the family. 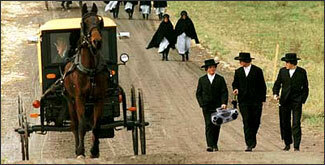 The Amish use only their own milk to make their cheeses. They are passionate about the quality of their products. The aroma of authentic cheddar should be nutty or grassy, with a rich texture and complex flavors ranging from fruity to a woody oakiness. Factory processed cheddar is usually rubbery and dense and without the few cracks you will find in your Bouche farmhouse cheddar which can range in color from straw yellow to beige with a red bloomy rind from the cherry wood it is aged in. There are two theories on how Cheddar got its name. The first is that it is named after the English town Cheddar in southwestern England, where the cheese was first made. The other theory is that the name derives from one of the steps in the cheese-making process. After the cow’s milk curd is scalded twice, it is “cheddared” by repeatedly being cut up to remove whey and breaking the curd until it is smooth and silky. We love English Cheddar for its buttery, nutty richness, without the slightest hint of bitterness or bite, but we are addicted to the Amish Cheddar. This richness and creaminess can in part be attributed to the cow’s milk from which Amish Cheddar is made. This breed is renowned for having the perfect fat-to-protein ratio, which results in a fantastically, full-flavored cheddar. The flavor of Cheddar is often described as “sharp,” which is a direct relation to the acidity level. The higher it is, the sharper the cheese tastes. It is very easy to put this “sharpness” into cheese, and it actually kills other flavors. So what most farmhouse cheddar makers strive for is a breadth of flavors that develop with time. You’ll know great cheddar if you can still taste the sweet nuttiness several minutes after you have finished your first mouthful. Cheddar can be paired wonderfully with dark beer. Please visit our web site for more information on this cheese and others Florida Cheese Club or like us on Facebook for GREAT recipes. With the burgeoning interest in health foods, cove or artisan cheese has steadily been receiving the recognition that it deserves. Until recent years, the only cave cheeses on the market were imported from Europe. Now, however, enterprising farmers have traveled to Europe and learned the secrets from master cheese makers. These Artisan-Style cheeses are made from raw (unpasteurized milk) obtained from animals located on the farm where the cheese is made. The cows are pastured on organic, chemical-free grasses and receive no hormones or antibiotics, only homeopathic remedies, if necessary. 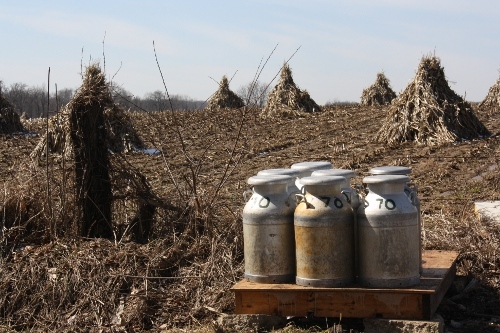 Raw milk can be safely used in the cheese making process. The FDA requires that all raw milk cheese produced and sold in the United States be aged for a minimum of 60 days, the time deemed necessary to destroy any or most harmful bacteria. Cheese made from raw milk or whole milk is superior in taste to those made from pasteurized milk. Most pasteurized milk is from a collection of dairies and is generally tainted with chemicals. The heating process used to pasteurize milk destroys many natural enzymes in the milk that affects the cheese making process. Pasteurization also results in the loss of many delicate flavors and retards the ripening of the cheese. Artisan cheeses are handcrafted and a work of art in the world of cheese- making. The milk is chilled and transferred directly into the cheese vat and heated. The original culture from France (kept from batch to batch) is added once the milk reaches the correct temperature. Soon vegetable rennet is added and the cheese making process begins. Smethe: Cheese is not pressed but allowed to drain naturally to retain the natural enzymes. The wheels of cheese are rubbed with Celtic Sea Salt and placed in a cave where the temperature of approximately 58 degrees is maintained in a humid atmosphere. Humidity, air circulation and temperature are the three factors that control the maturation of cheese. The process of aging and maturing the cheese is called Affinage, a name givenby the French. In addition to flavor, many healthful compounds may be developed during affinage. During this manually intensive process, wheels are brushed with Celtic Sea Salt, water or other liquids and turned every two or three days. Molds are encouraged to grow to produce specific rinds, blue veins, etc. The mold’s job is to protect the fresh curd. The rind of the mold extends the life of the curd by acting as a barrier to contaminants and by holding the moisture. There are two categories of mold-ripened cheese – Natural Rind and White – Mold. Natural Rind cheeses are acquired naturally without a lot of help from the Affineur (the one who carries out the work of Affinage). White – Mold cheeses have their rind grown using a strain of culture. They are often created in laboratories to produce a certain affect and purchased by the cheesemaker. The mold on natural rind cheeses may be various colors. Whatever the color of the mold, it represents a natural process and is quite edible. Only a bright yellow color should be avoided. Eating the rind is a matter of personal preference. The rind will definitely make the cheese stronger in flavor, but the choice if eating or not is up to the individual. Artisan cheese should never be stored in plastic as it kills the healthful enzymes. To store, wrap cheese in was paper and then in aluminum foil. Place in the vegetable bin of the refrigerator. Freezing this particular style of cheese results in loss of quality. Bring cheese to room temperature before serving for the best flavor. Americans are now learning what Europeans have known for centuries and the Artisan Cheese Cart is replacing the dessert cart in many upscale restaurants in major cities. Most restaurants retain the services of a wine and cheese expert or Fromager. Some places even have their own well stocked cheese caves on the premises to provide their customers with the best in Artisan Cheese. The time and labor required to produce these cheeses is reflected in the price but that has not deferred the many that are enjoying the taste and healthful benefits of Cave-Aged Artisan Cheese. BOUCHE’ – Bouche’ is an approximately two (2) year old Cheddar that is aged in forty (40) lb. blocks at 50 degrees. We then cut up the block into four(4) and put it in the cave with the Smethe. It is then treated and handled the same as the Smethe. It ages for approximately ten (10) weeks or until the White Mold has completely engulfed the block of cheese. It is then ready for sale. BOUCHE’ French Renaissance word meaning “square with a knife” This is a Cheddar type cheese. SMETHE French Renaissance word meaning “smooth”. This is a camembert (KAM uhm behr) type cheese. It has a subtle salty taste with fruity overtones.